Richard PESKETT, b. 1835 Adversane, Sussex, England, son of Peter PESKETT & Martha HARWOOD was married in 1858, at Glenorchy, Victoria to Martha Jane TYRER, b. 1837, Kangaroo Island, South Australia, daughter of William TYRER and Mary CONNOLLY. Martha TYRER had a sister Ellen BEDDELL (nee TYRER) living at nearby Sandford, Victoria. NOTE 1: Caroline PESKETT, b. 1837, Arundel, Sussex, m. Robert YARROW in 1859 at Littlehampton, Sussex. NOTE 1: Rebecca PESKETT, b. 1839, Arundel, Sussex, m. Albert PRINCE in 1865 at Arundel, Sussex. 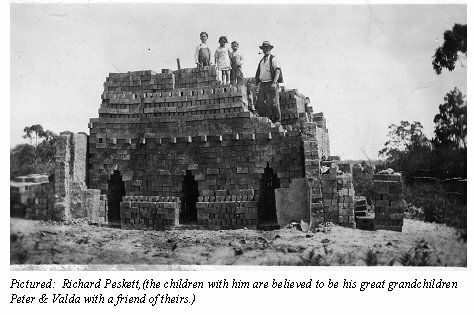 Richard PESKETT who apparently arrived at Portland, Victoria on the "Lizzie Webber" in December, 1852, became a brickmaker "Warrock", "Nangeela" & "Muntham" Stations near Casterton in southwest Victoria. 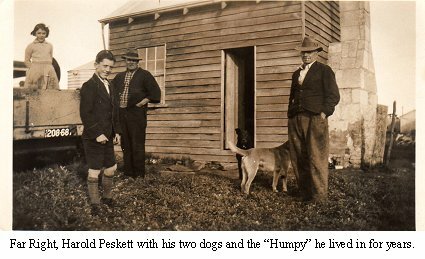 Richard PESKETT and his wife Martha both died at Casterton in 1921 and 1884 respectively. Richard PESKETT b. 1857, Coleraine, Vic, d. 1934, Cunnamulla, Queensland, m. Mary McDougall McKINNON at Wentworth, NSW and had the following known children in NSW. It appears that members of this branch later went to Cunnamulla in Queensland. Richard PESKETT, b. 1883, Hay, NSW, .........? Charles Hugh PESKETT, b. 1890, Hay, NSW, m. Marsha Jane EVELYN ? male PESKETT b. 1860, d. 1860, 'Muntham Station', Carapook, Vic. Peter PESKETT, b. 1887, Casterton, Vic, m. Annie ? Harold PESKETT, b. 1889, Casterton, Vic, d. 1960. George PESKETT, b. 1897, d. 1897, Casterton, Vic. Henry Harwood PESKETT b. 1866, Sandford, Vic, d. 1868, Mt Gambier, SA, Aus. Sarah Amy "Alice" PESKETT b. 1869, Edenhope, Vic, d. 1904, Melbourne, m1. William HANCOCK, m2, R. CAMERON ...............? Albert PESKETT b. 1873, Casterton, Vic, d. 1935, m. Ethel Mabel JONES 1892-1951.